Book Review, "God Bless You & Good Night"
Bedtime doesn’t have to be a struggle. Join the animal families as they enjoy each moment of their bedtime routines with peace and good humor. God Bless You and Good Night provides a special moment to snuggle up with your little one and discover God’s wonderful and comforting blessings. This beloved bedtime classic has touched more than 300,000 families and will be a favorite choice at bedtime or a perfect gift for any occasion. 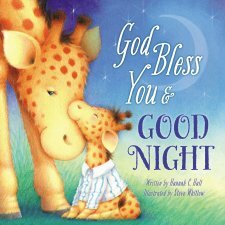 "God Bless you & Good Night" by Hanah C. Hall and illustrated by Steve Whitlow is a night pleaser before those little eyes closed for the day. This book is a nice hardcover book with adorable pictures of different animals on each page. I love the rhymes that happen on each page and incorporating the actions into a great bedtime routine. Start with stretching, bedtime snack, bath time, jammies, bedtime story, off to your bed, prayers, hugs and kisses, and I love you's. I originally was super excited for this book because my daughter loves Giraffes and that is what is on the cover of the book. However, it was nicer to see all our favorite animals as we turned each page. Pick up this book today and enjoy setting up a healthy bedtime routine using this book to guide you and your little one off to restful sleep. Thank you Booklook program for sending me this book for free in exchange for an honest review. I was not paid for this and all opinions expressed are 100% my own.